No T20 match nor an ODI will give so much thrill to spectators within the stadium and Cricket lovers around the world as this Mohali Test match did. It was a nail-biting atmosphere as India requiring 216 to win the match in the last innings, pulled off a spectacular victory to beat Australia by one wicket. VVS Laxman, despite, his backache remained unbeaten on 73 runs took India to a one-wicket win against Australia in the Mohali Test which ended like a live-wire. India has now taken a 1-0 lead in the series. It was Laxman and Ishant Sharma who put up a match winning partnership of 81 runs. Yesterday, India were 55 for the loss of four wickets and it was expected that Australia would finish the formalities by noon today and win the match, but that was not to be. 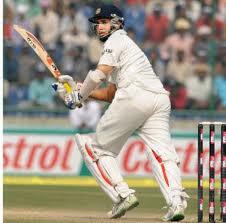 India had struggled to reach 162-8 at lunch on the fifth day after resuming their second innings at 55-4.